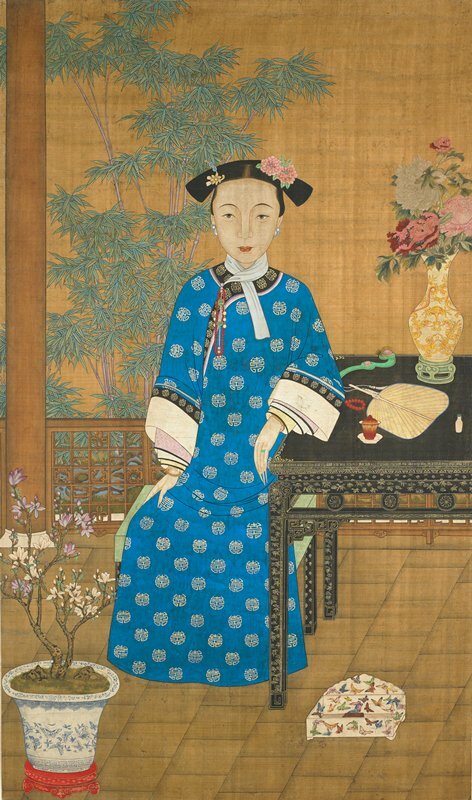 This aristocratic young woman wears a blue robe adorned with circular shou(longevity) characters, telling us that her portrait was commissioned to celebrate her birthday. She is seated at a lacquer table on a garden terrace, wearing a fashionable hairstyle and surrounded by refined and expensive objects. On the table near her elbow are a snuff bottle, fan, ruyi (wish granting) scepter, and a porcelain flower vase. At her feet is a blue-and-white flower pot and an unusual tissue container or sewing box, possibly made in Europe. Both objects are profusely decorated with butterflies, an auspicious motif whose Chinese character (die) is a pun for the word meaning “age 70 to 80”—another way of wishing someone a long, happy life.